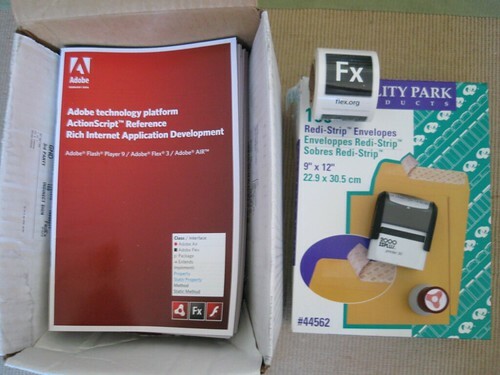 Well, now that I have finally sent out all of the books from the Ajaxian post (I ended up sending out nearly 400), I now have 100 Adobe AS3 RIA Reference Guides to send out. As you can see from the picture, I will be sending these out and only have 100. If you would like one, send me your mailing info (the info will only be used to send out the guides). You can find more info on the guides here and here. Update : Wow. That was fast. All of the guides are now gone. Everyone who got one should receive it in the next week or so.